Nidhogg is a dragon from Norse Mythology, who is found gnawing the roots of the World Tree, Yggdrasil. This bizarre placement is what is believed to keep the beast at bay from entering the Nine Realms as it formerly dwelled in Nilfheim as a Devourer of Corpses. For my design of Nidhogg, I went in-depth in trying to create a creature that dwells within and ever encroaching tree's root system, so I went with a squat body and long limbs and tail. I even made the tail super prehensile with the claw hand attachment. 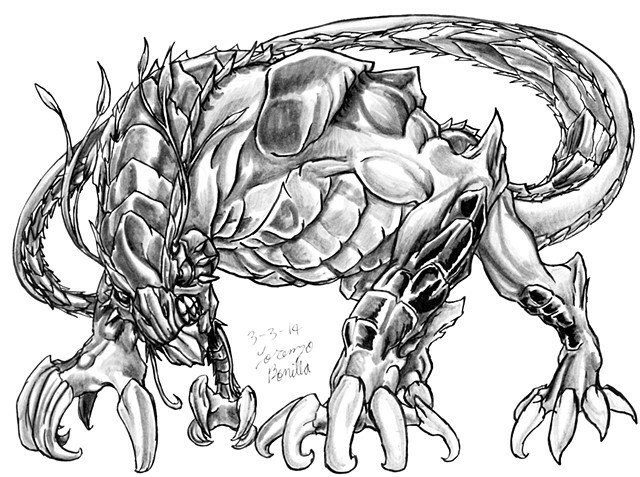 I made the armor plating have the consistency of bark while giving its claws hard nails akin to sloth claws. The head is what I focused on the most, by giving it a hard beak to snap down on the roots with solid molars for gnawing tough roots and instead of horns, insect-like feelers for it to navigate what is essentially, a limitless maze.